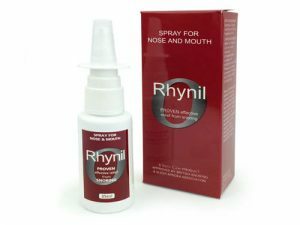 What Is Rhynil Spray For Nose & Mouth? Rhynil anti-snoring spray is not suitable for treating serious snoring problems. It can provide short-term relief in individuals whose snoring problems are caused by sinus infections, palatal flutter, and excessive mucus buildup. If you are a chronic snorer, then you are probably aware how much of a nuisance snoring can be. Many people who snore usually don’t acknowledge that they have a problem that needs to be solved, which is not responsible as snoring can be a sign of serious health problems like sleep apnea. It is important to take care of your health and do your best to stop snoring, not to mention that your family will be grateful to you for allowing them to sleep better as well. If you are not too keen on using anti-snoring devices that can be difficult to get used to, then Rhynil Spray For Nose & Mouth might be a great alternative for you. There are many top snoring aids on the market that do an excellent job at preventing snoring, but using this Rhynil Spray review will be of great help if you dislike the idea of sleeping with contraptions in and around your mouth and chin. This product is ranked #2 on our Best Anti-Snoring Sprays list. 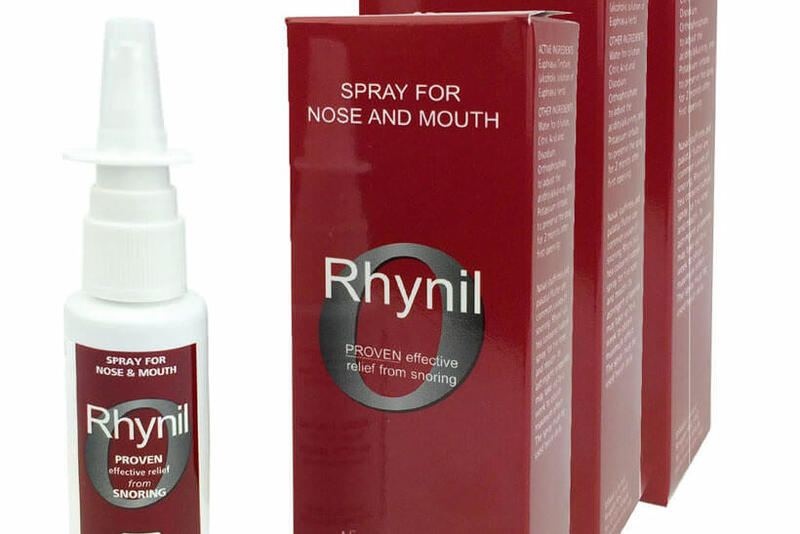 Rhynil Spray For Nose & Mouth is a snoring aid used to reduce or stop snoring. It’s very easy to apply – you should spray it in your nose and on the hard palate of your mouth every night before you go to sleep, which should eliminate snoring. The formula for Rhynil spray exists for over twenty years. It was developed by a member of the Institute of Medicinal Herbalists and initially named Snore Calm Herbal Spray. The fact that Rhynil exists for over two decades confirms its quality and effectiveness. This product is great for all those who suffer from snoring due to palatal flutter, which is why it should be used both nasally and orally. Rhynil spray is not only good for snoring, mind you. It also has antiseptic and antibacterial properties, which means that it can significantly alleviate the symptoms of sinus infections. If you often suffer from airway inflammation, then this snoring aid will make all the difference because it allows you to breathe more freely. Another great perk is that there are no known side effects of using Rhynil. The main difference between the Rhynil Spray and some other sprays is that it’s a completely natural product. It only has a few ingredients in its formula, such as the Eyebright plant, citric acid, and water, which further confirms that this spray is definitely worthy of your trust. If you haven’t heard about the Eyebright plant before, it suffices to say that this plant is safe enough to eat, so using Rhynil spray cannot endanger your health in any way. Both experts and customers who tested Rhynil Spray came to the same conclusion – this aid is very easy to use and it gives good results. This spray is effective both when it comes to treating your snoring problems and reducing breathing issues caused by different nasal and sinus inflammations, as well as allergic rhinitis. Rhynil is sold in 35ml bottles. One bottle will last for about four weeks, dispensing approximately 350 sprays. The price of this product is $29.95, shipping included. If you are still unsure if Rhynil Spray is right for you, check out the key advantages and flaws of this snoring aid. This Rhynil Spray review was brought to you by highly-skilled experts and complemented by user reviews. We have to say that we highly recommend this product against snoring, especially If if you have no intention of getting an anti-snoring device. Its natural formula will help you with your snoring problem, keeping your airways completely clear. Our ratings are the result of an objective and independent evaluation of Rhynil Spray, generating the final rating that reflects the overall quality of the company. Ratings may change as the product introduces changes. Rhynil Spray user rating based on 9 user reviews. I was never snoring that loudly to begin with. My husband simply described it as breeding heavy. However, I really started feeling tired after waking up in the last couple of months and wasn't able to get a good night's rest no matter what I did. I've tried several nasal sprays and this was the only one that actually helped me breathe normally and didn't leave me with this disgusting taste after using it. I thought my nasal inflammations will be the end of me. If my husband is to be believed, I use to "snore like a banshee", often waking up gagging and coughing. This little spray took about two nights to start working and I can finally sleep in the same bed with my husband without the fear of constantly waking him up. Didn’t help me stop snoring, but I do breathe more easily. It should definitely be cheaper, it’s just a spray. My favorite spray so far. It works almost instantly and from what I can tell, its effects last all night, which was not the case with other sprays I’ve tried. Wait a minute! There's a thing that can take care of my sinus infection and snoring at the same time while killing the germs and all I have to do is spray it into my mouth instead of wearing ridiculous addons all night long??!! It works and I'm just sorry I didn't find out about it sooner. Hands down the easiest way to cure snoring. I wish it was cheaper, though. My old man snores like a fog horn. He used nasal strips and face straps and whatnot. I got him this spray and his snoring is more tolerable. This spray tastes horrible. I really don’t like the taste. We found 0 verified Rhynil Spray discounts for April, 2019. There are no Rhynil Spray coupons or discounts right now. In order to be sure that Rhynil Spray truly is the best solution for your snoring troubles, you need to know what makes it superior or inferior to its alternatives. Discover how Rhynil Spray compares to other popular snoring aids of its kind with our detailed feature and price comparisons and easily determine whether you are making the right choice.